Why Walk Over Brooklyn Bridge? 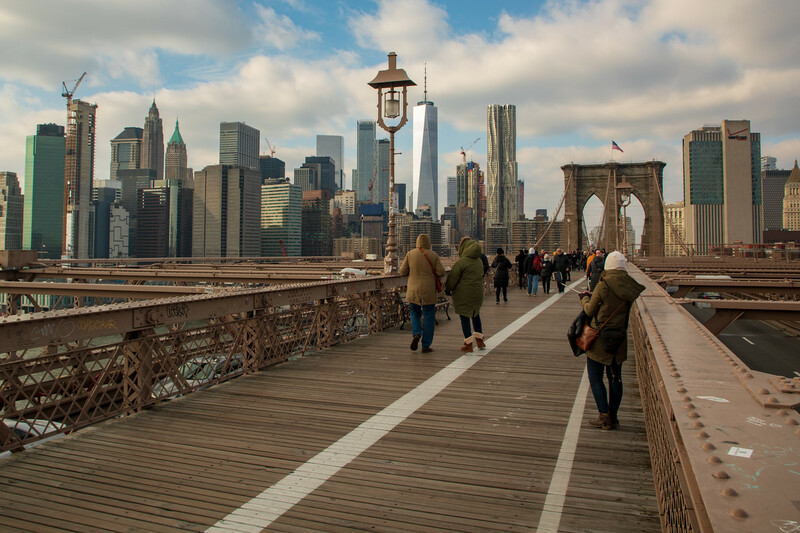 The walk across Brooklyn Bridge rewards you with great views of the Manhattan skyline, downtown Brooklyn and the Statue of Liberty. And it’s free to do! We visited in the middle of the day, but Brooklyn Bridge is open 24 hours. The views are supposed to be even more spectacular at sunset, but with temperatures plummeting to below freezing when we were there, we were more than happy to cross midday. How Much Time Should I Allow To Walk Across The Brooklyn Bridge? 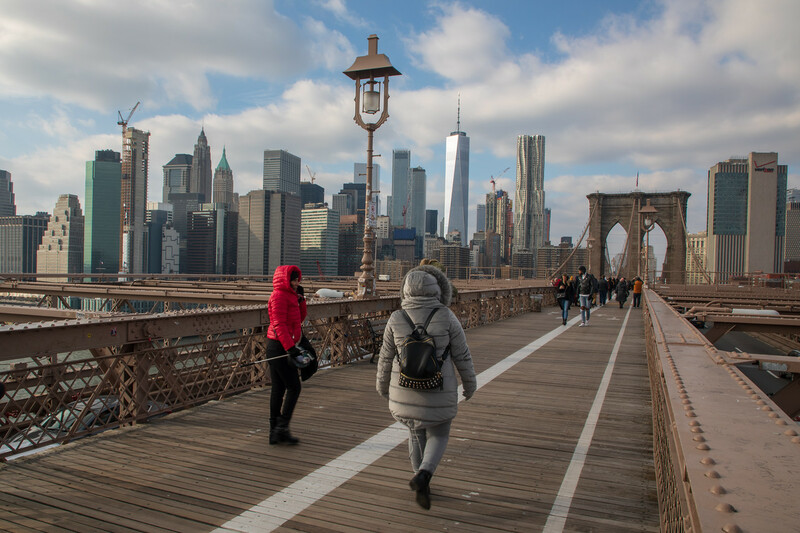 Allow yourself at least 30-40 minutes to walk across the 1.3-miles, take pictures of the Brooklyn Bridge and enjoy the views. At sunset and during the warmer months, there will be a lot more visitors so probably a good idea to factor in more time. Also, avoid standing in the bike line, New York cyclists will not be pleased and will be sure to let you know! I know from experience. The Brooklyn Bridge passes over the East River. The river which is actually a tidal strait, links the New York Harbour, the Harlem River, and the Long Island Sound. It’s not safe for swimming due to 300 years of industry that has taken place here. 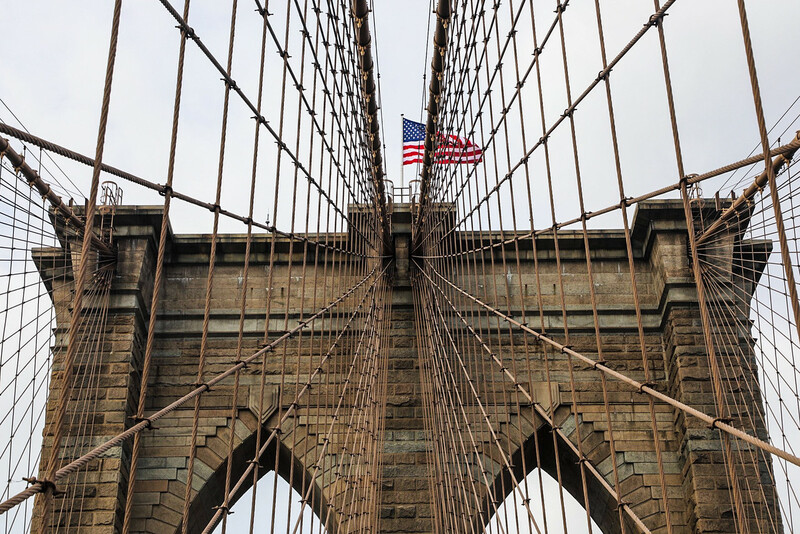 Apparently, Brooklyn Bridge was built with defective wire! The Bridge was originally intended to be six times stronger than necessary, but the wire used was poorer quality than planned. When they realised this, it was too late to change the wiring. However, don’t panic as the current cables are still four times stronger and the bridge is still doing well! The four main cables that hold up the platforms on Brooklyn Bridge consist of 6,239 wires, each thinner than a human hair. If you were to lay out all these wires from end to end, it would measure more than 3,500 miles or 5,600 kilometres. The bridge was built between 1869-1883. More than 150,000 people crossed Brooklyn Bridge on its opening day in 1883. The Bridge Towers are made from Maine Granite and stand 84 metres above the water. More than 30 people died during the construction of the bridge including John Roebling, the chief engineer. The bridge cost $15.5 million to build in 1883. Barnum walked across Brooklyn Bridge in 1884 with 21 elephants to promote his circus and squelch any doubts about the stability of the bridge. When the bridge opened in 1883, it was the longest suspension bridge in the world. On the Manhattan side: So much history to explore in Lower Manhattan. City Hall, Wall Street and much more are all within close walking distance of the Brooklyn Bridge. On the Brooklyn side of Brooklyn Bridge: Take a walk through Brooklyn Bridge Park. Explore the historic neighbourhoods of Dumbo and Williamsburg. Enjoy a fantastic pizza at Grimaldi’s or ice cream at Brooklyn Ice Cream or one of the many hip bars and restaurants in the vicinity. Some great street art on this side of the bridge too. How To Get To The Brooklyn Bridge? Well, that depends on whether you want to walk across the Brooklyn Bridge from Manhattan into Brooklyn or from Brooklyn to Manhattan. We started in Brooklyn as that’s where we were staying and from the bridge, you get the most amazing views of the Manhattan skyline. 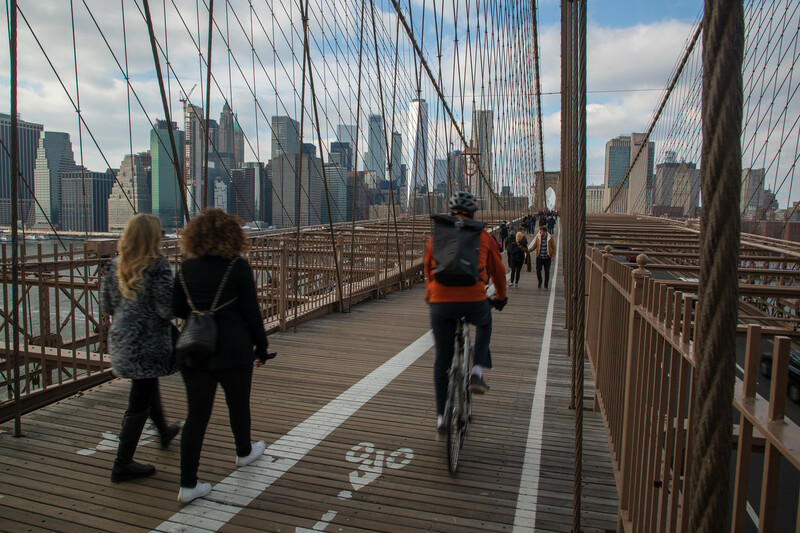 The Brooklyn Bridge Pedestrian Walkway and Bicycle Lane starts at Tillary Street and Adams Street. These subway stops are the nearest and within a short walking distance of the walkway. 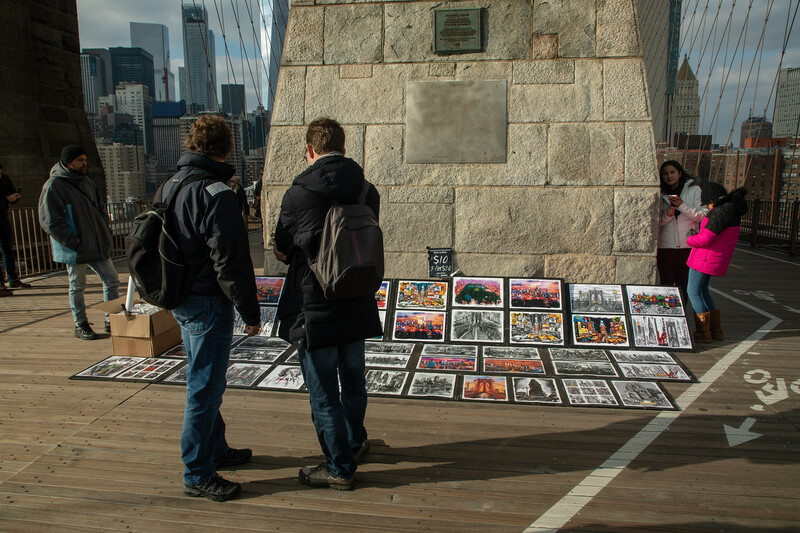 The bridge is just across the street from the subway station, you can’t miss it! the J or Z trains to Chambers St. Stop. I had no idea about the wires and wonder how they didn’t plan right with them. At least they found a fix! Brooklyn has been a place that I would love to visit and I love that the bridge is available to cross 24hours even if it does get below freezing around sunset. I also didn’t realize that the bridge was over a mile long either, so thanks for the heads up! Nice article! I have not yet walked across the Brooklyn bridge, but feel like its something every person should do at least once. Its sad to hear that so many people died trying to make the bridge and never got to see its completion! If you’re in New York, a walk across the bridge is a must. Next time I warmer months, I’d love to see sunset from there. Thanks for sharing. I go to NYC a couple of times a year and love walking across the Brooklyn Bridge. Some of my favorite pizza spots are over in Brooklyn. Its such an iconic bridge! I really felt like I was walking across history when I did it. Also, best to walk from Brooklyn to Manhattan – much better views! Great photos! What an iconic bridge to walk! I had no idea that the Brooklyn Bridge had such a wide pedestrian path across it, and that it’s free too. I can imagine a sunrise or sunset crossing makes for some incredible photos, though with it being 30-40 minutes, I can appreciate the suggestion to go at midday during the colder months! I’m yet to visit New York but I think I’ll need to plan to spend at least a week there to do everything I want to do including walking across this iconic bridge. I liked that you included tips on what to see and do either side of the bridge too. A very comprehensive and helpful guide. Your pictures are amazing. I did walk the Brooklyn Bridge once and we did it at sunset. So, I get it when you say the views are amazing at sunset. But now I am inspired to go back there during the day too. Your pictures are so clear and detailed. I would love to go back and click some more. I’d love to catch the sunset on Brooklyn Bridge. It certainly is quite an intriguing bridge, I remember visiting it about 4-5 years ago and taking a quick walk across but I didn’t take enough pics! It’s a pity however that so many people died while constructing it! You pointed out some very interesting facts about the Brooklyn Bridge. I had no idea it was made up of thousands of wires so thin (and under specification)! And, I can almost envision the elephants crossing over. Imagine what a sight that must have been! It sure does give a great view of the skyline–I’m adding it to my bucket list right now for my next trip to NYC. Thanks for the useful info! That capture of the cables (close-up) is wonderful. And, the facts about the same made me appreciate the engineering all the more though it ended up faulty 😀 Never knew that the bridge was so wide.I am sure the views from here would be mesmerizing.